Beautiful breeze out of the West today. 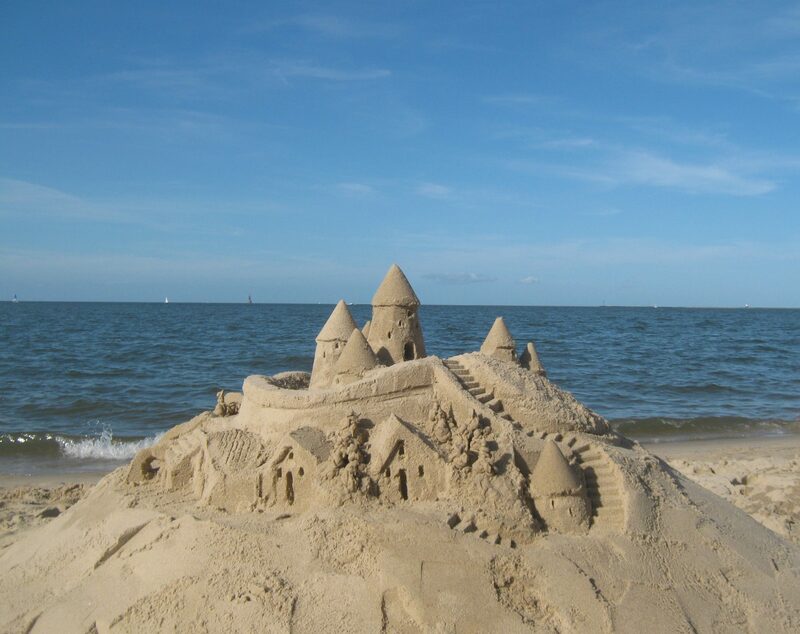 It was great weather today, building my castle. 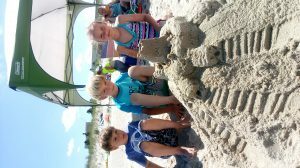 Caleb and Kristine, 8 year old twins, worked with their brother, Davey, 5 years old, and made a great castle. 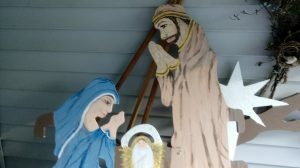 They are from Lancaster County, Pennsylvania. 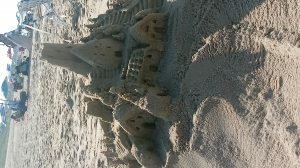 Here’s my castle today, but I just got the bad news that it was destroyed before sunset tonight. I am going home tomorrow, and won’t build tomorrow, but will be back Tuesday, and hopefully will build again. 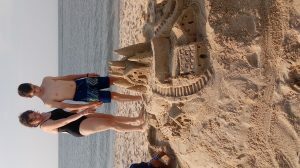 Jeremy built a great castle in record time! His mom said they had to leave in 20 minutes, and he wasted no time! 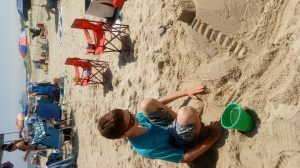 He’s 12, and lives in Port Tobacco, Maryland. 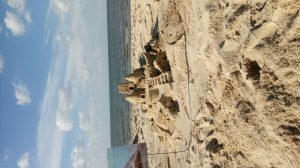 Amelia built her first castle today. She’s 8, lives in Lewes, and was here with her Grandma Sue, who is from Greenfield, Massachusetts. Even though thunder chased me (and everyone else, I did get to meet a girl I taught last year. Ashley 11, was with her mom, and brought her friend, Scarlett, also 11. 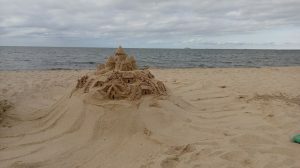 They were really trying to get a castle built in between threatening storms! I also met 3 friends from Pennsylvania only here for the weekend. Kira, Tabitha, and one more friend whom i didn’t get a chance to meet. Beautiful, personable girls, who were fun to talk with- I only wish the weather would have cooperated! 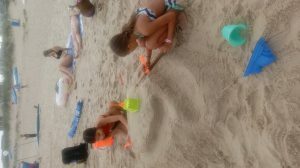 Friday’s castle, with new friends. 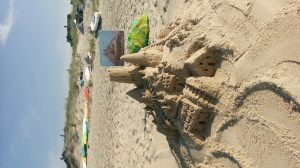 I know how to build castles, but not how to make these pictures behave. 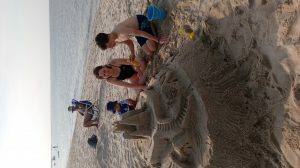 Here are new friends Max and his Aunt Janice, with my castle today. 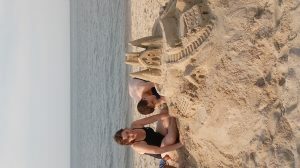 First castle of the summer for me. 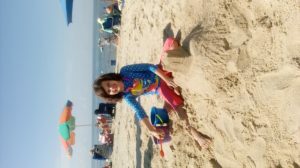 I met a sweet 6 year old, Amelia, from connecticut today,and showed herall I know about castles. Really looking forward to August! 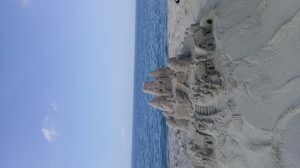 I am really looking forward to building sand castles August 7th to the 23rd! I will return for one more week on on September 11th till the 18th. I hope to see you all then!